I have recently bought a set of dolomite sprint wheels to replace the standard wheels on my spitfire. Now i have bought them i have realised its not going to be a straightforward swap. When i bought them the previous owner said that he was going to fit the to a triumph herald and gave me all the bits he had bought to do it, including two 3/4" thick wheel spacers with 7/16" UNF studs for the front wheels and 1" thick wheel spacers with 7/16" UNF studs for the rear wheels. 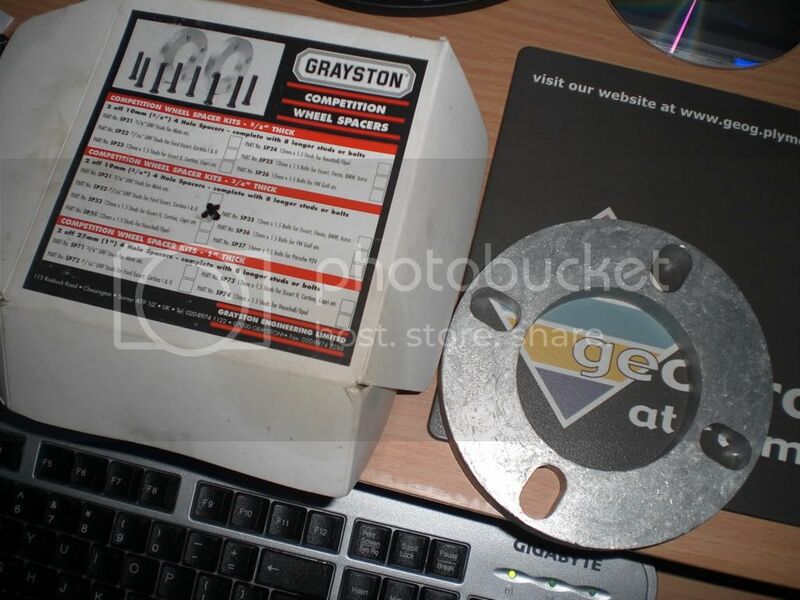 (Both sets were kits supplied by Grayston) http://www.graystonengineering.com/wheelnutmenu.htm [under competition wheel spacer kits]. My current concern using these spacer kits to fit the wheels is that the wheels are no longer going to be supported by the hubs. This is where i really need some advice. Do the wheels need to be supported by the hubs? if so how do i go about fitting these wheels? Sprint alloys have a different offset to spitfire wheels. The kit you have will work but will put extra loads through your drive train which may result in rapid failure of the weaker components like wheel bearings and trunions. I would not fit such a kit or sprint alloys. Plenty of correct offset alloys are avilable from a well known online auction site! I've fitted Dolly Sprint wheels to my mk3 using spacers of 15mm front (to clear GT6 brakes and upright) and 10mm rear coupled with longer studs from Jigsaw Racing. It works clearance wise but I'm not happy with the location for the reasons previously mentioned. I'm therefore having some spacers machined up from solid that will locate in the wheel bolt holes and / or hub - we're currently looking at the design as the hub centre on the Dolly wheels is just an as-cast surface. if you're interested I could get you a price for doing some? I can't swear on a stack of Spitfires, but on other 'small chassis' Triumphs there is no projecting hub to engage with, locate and support the wheel. Vitesses, for one. I did exactly as you suggest, Spearson, on my Old Blue Vitesse (pic), with no problems. Subsequently, I moved on to wider steels and to Revolutions that require a similar spacer, and although racing does lead to axle failures, it's not the wheels that fall off, just the whole hub! I would have no hesitation is using the kit you have for road use, but use steel wheel nuts, not the O/e alloy ones, which are too soft. Chris Witor can supply steels. Yeah, when i picked the wheels up they came with oe dolly sprint wheel nuts (aluminium) and i don't like the idea of having aluminium wheel nuts! I'll look into getting a set of steel wheel nuts as soon as possible thank you for all your help so far ill post up a picture of the car with the new wheels on as soon as i have finished fitting them. I have encountered a problem with fitting these wheels to my car. Namely the rear hubs. I have tried and tried to remove the hubs from the driveshaft to no avail. I have read in several places that you need the special triumph hub pulling tool but i'm not willing to fork out £50-60 for one. I already have a sturdy hub puller which i have tried to use and it will not budge, i even tried using a slide hammer on the hub puller to free the hub, but nothing. If i can't remove them i'm thinking about replacing the entire halfshafts with reconditioned ones from canley classics. Unless anyone can suggest anything to help remove the hubs? I think the only way is to use the Triumph puller. I scraped 2 hubs trying to remove them with a normal puller. Buy the tool and have it done in 10min. Maybe someone lives near you who has one. Where are you? Do you know anyone with a fly press that could press the hub out. I have dolly sprint alloys on my 1500, 5.5J and have no issues. had to file down the edges of some of the wishbones but other than that its fine. I'll see if I can find more details on how I did it. what problem with the hubs? i was going to put sprint wheels on mine and the only prob i found was the center being a bit tight,could you not clean the center hole of the wheel out with a flap wheel in aa drill if so. 1998 Peugeot 106d..... cheaper than chips to run! I live in Kidderminster. I think its about 40mins from stroud. You are welcome to come and use mine! Do not touch the glass. Do not approach the glass. You pass him nothing but soft paper - no pencils or pens. No staples or paperclips in his paper. Use the sliding food carrier, no exceptions. If he attempts to pass you anything, do not accept it. Do you understand me? Are you trying to remove the hubs to fit the new studs? Can you not drill a hole in the brake back plate & fit them that way? What happened to this? Does anyone have a tried and tested way of doing this? I want to put 1300 steels on my herald and don't want to buy them without knowing. If from a herald or spitfire they will be fine. If from a 1300fwd car they will have a very wrong offset, from a dolly 1300 probably fit but too much inset to look correct. Would they not be the same profile as dolly sprint wheels? Similar. Can't guarantee they would fit, but they do sit further in than herald wheels if they do. You may need a small spacer at the front, but probably not. However, I would suggest a decent set of vitesse wheels would be a better idea if possible. Thanks, I will have to do a bit more digging. I like the slots and the idea of keeping the hub cap. i also found this on the forum, so I'm sure its possible.